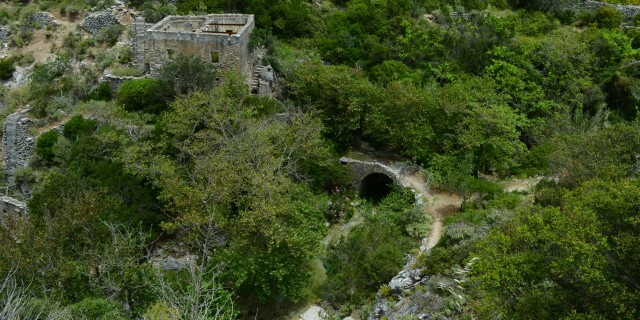 A beautiful path from Mylopotamos to the waterfalls and gorge with the old watermills . Departure and return point: Central Square of Mylopotamos. Duration: Approximately 2 hours . However, the path is beautiful and so it is likely to want to extend your stay in the gorge with the watermills. Route type: Difficult . The route is a canyon through a rather narrow path, which runs parallel to the river that starts from the waterfall of Mylopotamos. The trail is in good condition, but you need to pay particular attention to the stones and the very steep parts. The route is not recommended for those who have fear of heights . Also , be aware that you will need to cross the creek a few times walking from stone to stone . You need to take water , food, a book perhaps , and swimwear , since there are several small lakes during the journey.